Instantly awesome! Give your shows a quick style boost with effects packs. Ordinary shows effortlessly become amazing. Spice up your shows with flashy animations and slick, professional layouts. Each volume offers diverse styles suitable for any slideshow. A wide array of unique styles with title designs, illuminating transitions and a variety of image & video effects. Effects Pack 7 is a collection of slide styles and transitions inspired by light and shape elements to liven up your videos with a conceptual burst of energy. Create beautiful shows with a distinctive, unified look. Each collection offers sets of styles with themed art backgrounds and classic motion effects. Go beyond simple fades with an exciting array of modern transitions that instantly energize shows with freshness and sophistication. 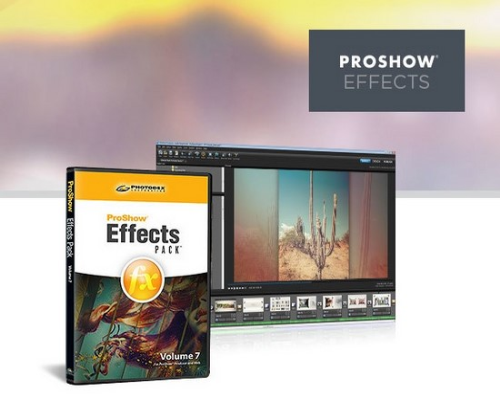 These effects work with ProShow to create amazing video slideshows on your desktop, online, or mobile.